Keep your hands free. It’s one of the first things I’ve learned at my first CES show, on my first day at the Las Vegas mega-conference while attending the “See It First at the 2013 CES Unveiled” event. The ‘Unveiled’ event at the Consumer Electronics Show is for the press only and it showcases about 70 of the over 3,000 vendors to what seemed to be hundreds if not thousands of press members. I arrived to the event 15 minutes early, only to find an incredibly long line up of press people already in line waiting to get in. There were TV cameras taking pictures of the long line up of press people who were taking pictures of the TV people… You get the idea. Once we all got in, it was like a mad house of vendors demoing their stuff and journalists asking questions. I quickly learned that if I want to have a good look at a device, my hands have to be free. So I stuffed everything in my back pack and started to navigate through the various displays. If you are a game fanatic, this was the place to be. On display: a dozen or more different head phones to make the sounds more real, many game attachments and even more tablets that are for the real gamers. I must admit that I’m not a gamer, though I’m a bit of a gadget nerd with an iPhone, iPad mini, regular iPad, BlackBerry, and a Nike fuel band with me in Las Vegas. While I do like unusual electronics, being cool is not enough, it should have some ROI, pretend or otherwise. Many of the products were cool but the ROI was questionable at best. One gadget that I liked is a set of ear bud headphones called the cord cruncher, where the cables didn’t twist or knot which my earphones do all the time. The cord cruncher has a sock-like cover on it that stretches over the cable when not in use and the cover retracted when the cable for the earphones were in use. 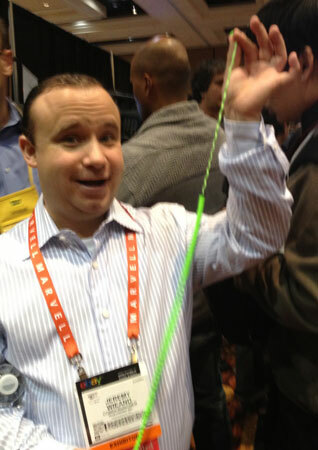 The cord cruncher might prevent your headphone cables from tangling, but where’s the ROI? One of the gadgets with some ROI charges multiple (up to 6) devices at the same time. Then there was the device (projected to cost $50) to track your luggage that delivers real time information regarding its location, staring as soon as your plane lands. 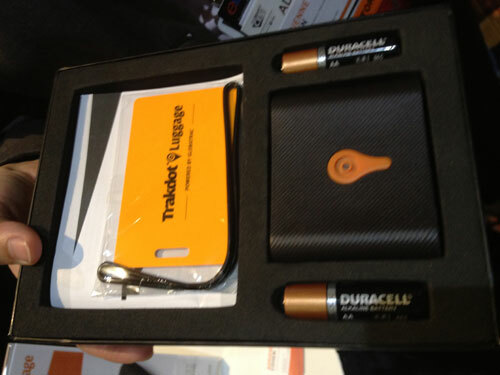 Have peace of mind that you won’t lose your luggage with this tracking device. There were CSI-like screens, bigger than most dining room tables, showing movable 3D images. With a touch of a finger you could move the images all over the screen, from background to foreground, or show maps and spreadsheets. 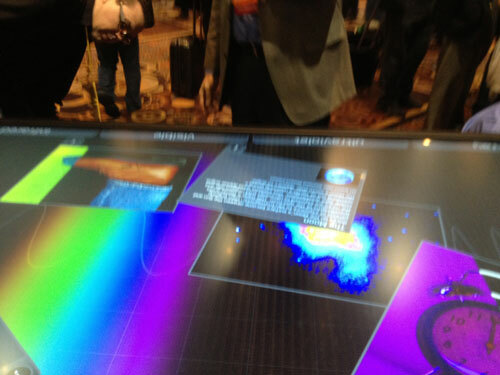 Touch screens inspired by CSI? The weirdest device was the HAPIfork marketed by… wait for it… HAPIlabs. It’s promised to help you lose weight and assist digestion. The HAPIfork monitors your eating habits, alerting you with indicator lights and the vibrating of the fork, if you eat too fast or not chewing long enough. In addition, the device measures the amount of fork servings taken per minute, the intervals between fork servings and how long it takes you to eat your meal. You can then upload the information to track your progress. All this for $99 per fork. These are just a small sample of what was at the “Unveiled” event. Tomorrow the real thing starts with over 3,000 vendors. I’m resting up for the big event!